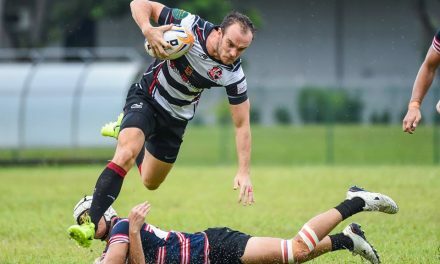 SINGAPORE: The Singapore Rugby Lions are a step closer to gaining promotion to the continent’s top tier – next year’s HSBC Asian Five Nations – after registering a 52-17 victory over Malaysia on Wednesday. The lunch-time kick-off at the Ansa-wa Stadium near Incheon, South Korea, ensured the Republic will be in Saturday’s Asian Rugby Football Union (ARFU) Division 1 final against the hosts, who defeated the Philippines 32-20 in a later match. Singapore, who brought a 24-strong squad to Korea, were expecting a far stiffer test from the Malaysians, particularly after only edging them 25-23 last year. But Singapore seized the early initiative with first-half tries from scrum-half Azmi Suliman and No 8 Peter McFeely. Further tries after the break from second-row Marc Warburton, winger Alex Chew, substitute Jonathan Chen, full-back Nicholas Groen and second-row Gabriel Lee, and a penalty try from fly-half Suhaimi Amran, who also kicked five conversions, completed the rout. “We knew Malaysia have huge skills with the ball and a very dynamic backline, so we kept the ball close until we created opportunities and could apply pressure, or ‘line breaks’, and get inside them,” said Singapore coach Des Thornton in a telephone interview. “But we moved away from that a bit in the first-half, and (before the) second half had a talk about it. “We needed more composure, especially from the younger guys. It’s different from club rugby, so they needed to be confident that it will work. Singapore last played in the top flight in 2009, and Thornton believes they can build on the win over Malaysia. “They’re a totally different sort of opposition,” he said. “The Korean forwards are very strong and dominant. We will have to play differently, and key for us is getting quality possession to apply pressure.